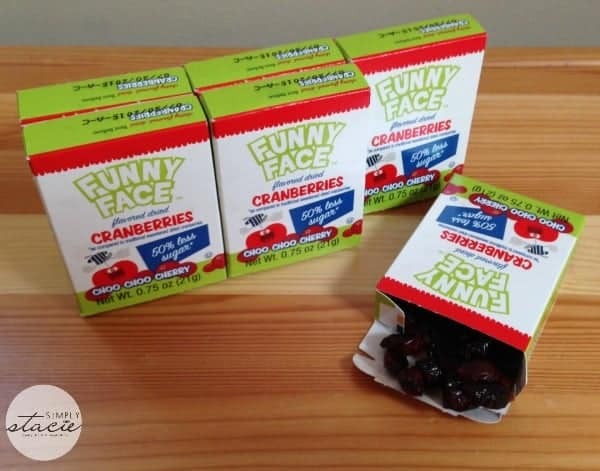 I discovered the Funny Face Dried Cranberries brand of snacks a few years ago and have been enjoying them ever since. They make a wonderful assortment of all natural fruit cranberry snacks that I like snacking on and that I feel good about feeding my family as well. They recently sent me some yummy snacks for review that I think make for great lunchbox snacks for kids and adults! Funny Face sent me six three-packs of their Choo Choo Cherry flavored snacks. These boxes are a great size for lunchboxes or for keeping on hand in your desk drawer at work. I love the cherry taste of these snacks and so do my boys. Beyond the great taste, these snacks also pack in all the great health benefits of cranberries, including antioxidant and anti-adhesion benefits. They’re also naturally low in sugar and fat free. 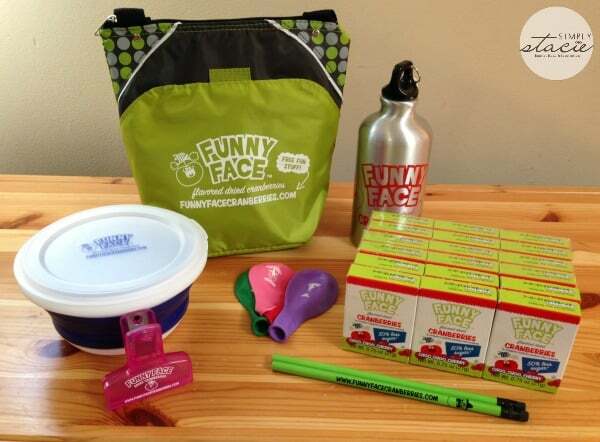 In addition to the yummy snacks, Funny Face also sent along a bunch of fun stuff for me and my family to enjoy – stickers, balloons, pencils, a bag clip, a collapsible travel bowl and an insulated lunch bag. Fun stuff from a fun company! The three-packs of snacks that Funny Face sent to me have an MSRP of $3.49. Funny Face Cranberries are a product of the Decas company, which has been in the cranberry business since the 1940s. Over the years they have researched better ways to grow, harvest, and process cranberries in order to bring tasty and healthy products to the market. They’re always striving to do better, so you always need to be on the lookout for new products from Funny Face! To see the full line of Funny Face products available, check out their website. This is knew to me, but if one can make drinking juice like cranberry juice fun, then some deserves a award! I learned the company has been in business for over 75 years. This company is over 3/4 a decade old!